The Society isn’t like any other engineering society. It’s a community united by a passion for making things and testing ideas. Their unparalleled devotion to their craft is evidence of a universal truth that’s relevant to us all; we learn only by doing. There’s something about Britain, it’s the land of God’s own hobbyists. But not only that, if there are more than two people in the country that are interested in a topic, they will feel almost compelled to for a club or society, and since this is Britain the club might well have been around since the early 1800′s or earlier. The bylaws will be arcane, and the committee structure labyrinth. It will inevitably serve tea and biscuits during meetings, rarely coffee. Because that’s how we do things over here. Mike Kapp lives in a peaceful cul-desac, quietly shaping his house into a system of his invention. Cat-flaps, clocks and ghostly machines are the fruits of a lifetime of problem solving and inquiry. His experience holds a lesson for us all: curiosity is the key to craftsmanship. The Makers of Things is a short film collection by Anne Hollowday. 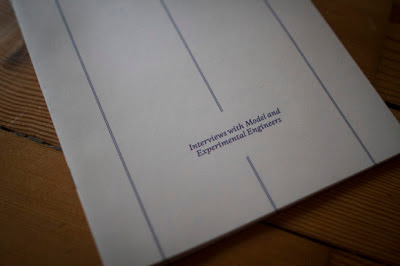 It documents the work and workshops of the Society for Model and Experimental Engineers, a sprawling organisation with members scattered all over the world. While today we hacker spaces, maker spaces and fab labs, back in the 1800′s they had the learned society. In the flickering light of a cinema Mike Chrisp watched a gentle Ealing comedy that would change his life. Now the linchpin of a world-renowned group of hobbyists and tinkerers, he builds models of the machines that inspired him all those years ago. Founded in 1898 by Percival Marshall, the Society seems to be almost a template, a model if you will, of one of these British institutions. Many were founded with royal patronage, and many still exist today. The Society has survived two world wars as well as the introduction of technologies that were not even be dreamed about when it was formed. The world is full of of people that are making stuff in ways that were impossible a few years ago. There’s always going to be that mixture of people that think if you don’t make your own castings and machine them with files, cold chisels and hammers—you’re not doing it properly, and the other half that think the right way to do it is to use a laser—and increasingly things like three-dimensional printing, are coming along, and changing the way everybody works. Norman Billingham’s workshop has been pulled up around him over a lifetime. Chippings, clippings and filings fill a garage used to transform lumps of wood into beautiful pens and functional furniture. Although a scientist by training, Norman is the first to admit he’s always been a maker of things. Filmed almost entirely in the garage workshops of the members of the Society, the series of films evokes an atmosphere that’s possibly uniquely British, and it transports me back to my childhood. I can almost smell the wood shavings in the last of the four films. If I had to live without it I could, but it’s something that’s been a part of me for a very long time. I’ve always been someone who makes things. That’s what I do, it’s always been a hobby. I’m a scientist by training—professionally—life’s work. But I’ve always been a maker of things. As well as the film series, Anne also created a newspaper. It houses the extra stories and excerpts from the interviews that didn’t make it into the films, not because they weren’t fascinating, but because they needed a different medium to express them; as an accompaniment to the film series it acts almost like a projectionist’s commentary, or a more traditional programme you’d get at a theatre. …some of the longer stories that my characters shared with me about specific points of their lives, or particular machines and methods didn’t make it into the films which I was pretty sad about. These were stories about machines invented under a veil of secrecy in the Soviet Union that someone had managed to build a version of, insight into a childhood with homemade toys and the reason why someone had spent their life building a particular type of locomotive. Tiny fragments of these tales made their way into the films but not in a way that did their stories justice. I recently talked to Anne about her series of films, the newspaper, the story she was trying to tell, and the reaction to the piece both by the Society and others. How did you get involved with the members of the Society? I was on a bus going past Alexandra Palace in January 2012 and saw crowds of people streaming up the hill. It was more people than I’d ever seen going to Ally Pally before and a really diverse bunch of people – old, young, families etc, so I knew I had to find out what was going on. I looked it up online that night and turned out it was the London Model Engineering Exhibition. So I knew I had to go and see what was attracting such a huge bunch of people. The next day was the last of the three-day event and it was super busy again. We wandered round people selling tools, some trade stalls selling spare parts and sheets of copper, and saw almost every engineering society in the South East showing off their wares. I’d taken my camera along and a sound kit so I did a few interviews just capturing some of the conversations I was having with people. But then we turned a corner and met SMEE. They were all wearing blue work coats – every member of the society has one – and were standing up beside their creations proudly showing them off, answering questions and roping people in to make a pulley tool on a small lathe they had. Why did you decide to spend a year following them around, what made their story interesting to you? A short film from the interviews of that day. On that day, a lot of other people’s creations were incredible displays of ingenuity but you weren’t allowed to touch them. SMEE didn’t really mind about all that. They encouraged everyone to pick stuff up, see how it was made and just generally be inquisitive. I knew then that this was a fascinating bunch of people that I wanted to know more about. I made a short film from the interviews I shot on the day–it’s not a proper documentary, more a sort of film sketch as a tool for exploring some of the conversations I had and grouping them into themes. But that definitely made me want to capture this field in more detail. Can you see any parallels between them, and today’s hacker and maker spaces? Definitely. In a way, SMEE are like a hackspace – they have a workshop and a headquarters building where they meet regularly. I guess the difference is that having been around over a hundred years means they have a few more traditions and are more traditionally organised than a hack space – they have a council and a Chairman for example. But the sentiment is the same. They’re a community united by a passion for making things. When I’ve been at SMEE on their workshop evenings, there’s one guy who travels over 2 hours each way just to use the workshop for an hour or two surrounded by fellow members. That fascinates me. I kept asking him why he bothered, why he didn’t use his workshop at home. And all he said was, it’s just not the same. SMEE are really into CNC machining and are interested in 3D printing and other modern techniques too. In the Society film, Norman himself recognises that although there’ll always be people who think if you don’t make everything yourself with files and hammers you’re not doing it right, there’s another set of people who think that 3D printing is the future and CNC machines mean they can be more ambitious with their projects. And I think that’s what I love most about SMEE. They’re not preoccupied with nostalgia, they just happen to have a really rich heritage. What they do is make things. Do you think the current films reflect the Society as a whole, or did you focus on a single thread of their story? When I started out, I wanted to make just one film and I began filming and finding people to focus on with that in mind. But as time went on I realised that one film wouldn’t capture the essence of what makes these people who they are. One film would have skipped over little moments like the way Norman sees a ripple pattern in a piece of wood and the way Mike assembles all the little bits of his rail motor. For me, these bits are really important. It’s the power of film to show not just tell. And it reflects the texture of making things, the sounds and the look and the feel of materials. So, if anything, that was the way I approached the collection but it wasn’t really intentional, it just sort of ended up that those were the things that rose to the surface. There are four films—an introduction to the Society, the Problem Solver, the Model Engineer and the Woodworker. Will there be more? I did want to make sure I had a sufficient variety of approaches to craft but that wasn’t hard to find at SMEE. I think woodworking, model engineering and experimental engineering reflect a broad range of the types of craft SMEE members engage in but by no means all of them. SMEE have almost 500 members all over the world so I’d love to continue making more. What do you think the message of the series is, what story were you trying to tell with the films? If anything, it’s that we’re all makers of things. Sounds a bit cliched but the title The Makers of Things just came from something Norman said. He said that even when he was 14 and had a shed in his parents’ garden he made sawdust. I like the idea that whatever your discipline, your chosen material or intention, you can make stuff. What do the members of the Society think of your series? Have they commented? Several of them have seen them and have told me they really liked them. I think for them they’ve never really had the chance to see a real outside perspective on what they do. So I’m very pleased they see them as a genuine reflection of their hobby and the characters involved. I’m doing a talk at their next monthly meeting and will be showing the films to the full Society then. What other reactions to the series have you had? Have any surprised you? I’m been really chuffed by the reaction online and from family/friends at a screening I had last weekend. Everyone has said they liked the intimacy of the films, that they actually feel they’ve been offered a glimpse into people’s lives. Making stuff is a very personal thing and usually what we see of how other people approach it is a nicely composed photo of their desk all neat and tidy which is not how real life works. People have said they like that the collection feels very real and meaningful. What the people in the film are sharing is a lifetime of making and all the detail, emotion and hard work that comes with that. I’m really pleased people have picked up on that. Switching gears then, what equipment did you use to shot the series? The whole series was shot on a Canon EOS 7D with a range of prime lenses, with external radio mics for interviews. The blog explores worthy information and every fresher wants to go through it. Keep going.